The Shadow Conspiracy, a manufacturers of trick BMX components (and half link chains), has finally released their much anticipated axle conversion kit. The kit replaces the 14 mm male axle with a 3/8 female axle. The kit also includes dropout spacers to make up for the slimmed down 3/8′ studs. It will retail for aprx $29.99 USD. Why would anyone care about converting their existing raptor hubs? because BMXrs can be weight weenies too. There is no word on how much weight will be saved, but the female axle will be lighter and stronger. This is because when the width of the axle is reduced, weight is shaved, and less leverage is applied on the axle during peg tricks. This how to video demonstrates how easy it is to install the axle kit, but if you’re more interested in building a new wheel, you can always check out their recently released BTR cassette hub. 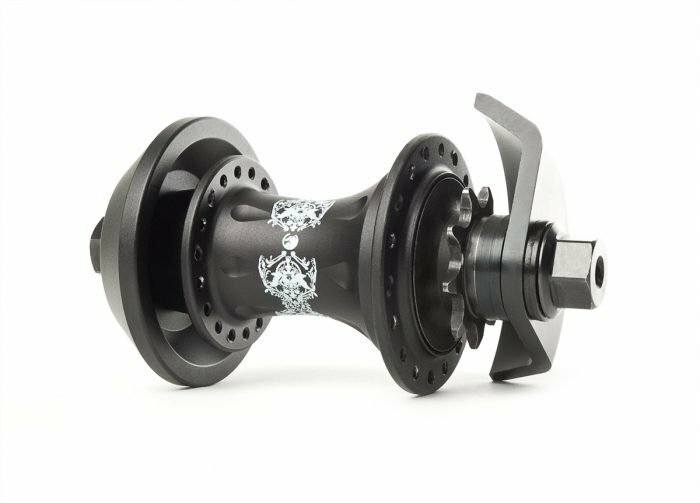 For a long time rumor had it there was a hub in the works which would be sold stock with a female axle and feature redesigned internals and this new hub doesn’t disappoint. The BTR Cassette Hub is made of 6061 hardened aluminum with 2 over-sized bearings. It includes a 1pc, 9t chromoly driver with polymer bushings, and is available with 36 holes in left or right hand drive. Shadow is also releasing a BTR specific drive side guard. This guard is compatible with all chains and is made from CNC’d, heat treated, 4130 chromoly. Like its non-drive side counterpart, this guard replaces the cone, and maintains the correct 110mm spacing, preventing riders from stretching their frames. I remember when I used to buy this stuff, I thought BMX components were so expensive… And now that I’m a roadie, it’s all so cheap in comparison. You guys should really leave the BMX stuff to the few sites that know what they’re talking about. @why: They didn’t do a bad job at describing what the hub is and what it does. The female axle does shave quite a bit of weight off but it also reduces the amount of axle sticking out from the dropout to save ankles from certain death. Other than that the description above is bang on. Pegs slip with female hubs such as this. Pretty much anyone who tries to run such a hub with pegs ditches it pretty quick! If you’re shaving weight on a BMX bike you might just be going without pegs and frame/pedal grinding etc….